As much as I love traveling, one of the best things about having an RV is the ability to sleep in your own bed with your own pillow(s) at night. Pillow's are as individual as people. They almost have personalities of their own. Now wait a minute..I'm not kidding. Haven't you had a favorite pillow that you just didn't want to give up because it was perfect? Finding the right one is often a long process with lots of trial & error. I'm no stranger to that route! Which pillow will you choose? 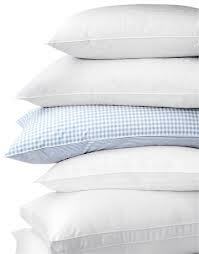 In this day and age there are a huge array of pillow types. It isn't just feather down any more! There's memory foam, regular foam, chunks of foam, polyester loft, cool side specials, buckwheat, plastic tubes, and every imaginable type of feather even "hypoallergenic" ones. Then there's the "firmness," these run from soft and squishy all the way up to rock firm. Hmm, wonder why no one makes a rock filled pillow? I'm KIDDING! I know why they don't. It would hurt. Or at the very least give you one helluva stiff neck! All that aside, they did use Jade pillows in dynastic China. They were supposed to alleviate various ills and transfer energy into the brain. I guess the "dent" in your head in the morning was proof it worked. D'OH! To pick a pillow you first have to decide on the "feel." Do you want your head to sink deep into it or float on top? In the United States there are mostly only two sizes; Standard/Queen and King. The main difference is the size. 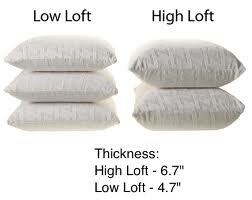 You'll need King sized pillow cases for the larger ones and sometimes they are harder to find. My bed's not that big, so I use the standard sized ones. I find that the pillows with a zippered case can be annoying. I've woken up in the morning with an imprint of a zipper on my cheek! If you like a pillow and it has a zipper, do yourself a favor and make sure you can put it on the inside of the pillowcase. That's the side that's sewn closed. I know how difficult it is to pick a pillow based on the quick "hand squeeze" we get at most stores. The plastic doesn't let you feel the actual surface and the air cushion from the bag can lead you to believe the pillow is something it isn't. Choose Wisely! 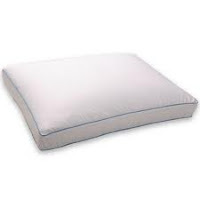 -Pillows are NOT returnable at most places. I mean who wants to by a used pillow? Who knows where it's been. Not my cup a tea at all! Since I sleep differently almost all the time. I'm the guy that cannot sleep on airplanes. I wish I could fall asleep anyplace at any time. I have friends like that. Makes for REALLY boring car rides or even quieter RV trips! What I did was buy multiple types. Is this article making you sleepy??? I have 3 pillows on my bed in the RV. High loft, high density one that supports my head. This one has gussets for "side sleepers"
This way I can choose my weapons for my mood or sleep pattern. Sometimes I switch in mid-sleep. Hey, normal isn't my thing...OK? There is nothing quite like boondocking in the middle of nowhere and getting a quiet nights sleep, makes all the troubles in the world seem so far away. 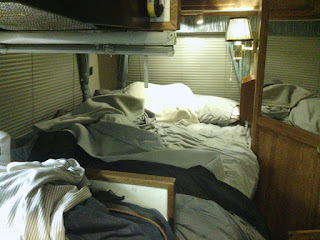 Somehow, I always sleep better in my RV. Fully Equipped Galley With Coffee Maker! Mmmmmm....coffee. Whether it's for a morning "jolt" to get the day started or as a mid-day "pick me up, " coffee is a good thing! There are many ways to prepare coffee, less ways to prepare good coffee and just about as many opinions on which is best. To give you an idea where I stand, one of the MUST HAVES for my ideal RV was some kind of coffee maker (or two.) On the road it can be a challenge to make a good cup (or pot) of coffee. There are easy ways to brew some and more complex ways, we'll take a look at a few of the more mainstream methods. Let's start with the basics. What makes a good cup good? I believe it's the water that begins the perfect cup. The more impurities in it, the lousier the coffee. Clean, filtered or even bottled water will be fine. Yes, I know there are REAL coffee fanatics that will argue the mineral content and mix will affect flavor, but that's WAY outside the scope of this article! Next is the coffee itself. It's always best to start with beans rather than ground coffee, since the flavors in coffee will begin to oxidize (lose/change flavor) as soon as it is ground. 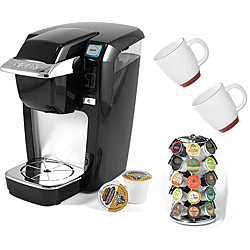 You can even find drip coffee makers that will grind your beans for you! Or simply use a small grinder (about $15) As a bonus, you can use this to grind spices and other small foodstuffs as well. If you want to use ground coffee, do yourself a favor and find a way to seal it into a container and pump out as much air as you can. This will keep it fresher, longer. 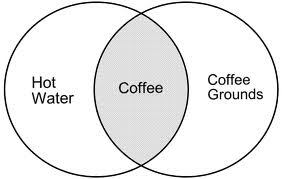 The ratio of coffee to water is critical, but based upon personal preference rather than science. As is the choice of your coffee. 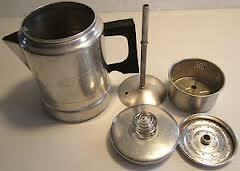 First of the brewing methods is the electric "drip" coffee maker. This is the most basic and usually the least expensive method. A current 10-12 cup unit can cost as little at $15 at the local mega-mart. While these will make a decent pot of coffee if you measure carefully, they aren't the best. They are, usually, the fastest. If your schedule or your brain says, "NEED COFFEE NOW!" than this is the easiest route. Bear in mind you will need 120V power to use it. Whether a generator, shore power, or inverter with a decent sized battery bank. It will require some serious short-term Amps. This makes an OK cup of coffee, a bit on the weak side and is pretty wasteful of the coffee itself. They even make a version of the drip coffee maker that's PROPANE powered. When you're in a hurry, though, it cannot be beat. Let's take a quick sidestep. When I use my large 12 cup coffee maker (when I have the power to spare) in the summer, I'll usually make a pitcher of ICED COFFEE with the remainder. Nothing beats iced coffee in the summer months! Next up is the tried and true, old fashioned "Perk Pot." This was originally designed to brew coffee over an open flame, so will work with almost any high heat source. Your propane stove-top is particularly good at evenly heating the pot. This method boils water into steam and circulates it through a basket of coffee at the top of the pot. There is a small glass "Percolator" at the top where you can watch the color and strength of your brew. In my humble opinion this method really smells the best. I love the smell of coffee in the morning! 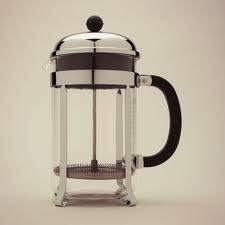 Some folks say the absolute best flavor from coffee can be had from a "French Press." This device takes a coffee and water solution after it has sit for a few minutes and slowly strains out the coffee by pressing it down with a plunger. The spent coffee ends up at the bottom, locked away by the plunger and you pour off the brew from the top. It does work. You WILL end up with some grounds in your cup AND you have to boil the water before you can use it. It's a bit fussy to use, especially for me in the morning, but it does make a rich flavorful cup. Afterwards you have to disassemble it and clean up. Since there is no filter the grounds have to be rinsed away. If I have lots of time, I would use one. Not often, but sometimes. Instant coffee. Bleh. I put that right up there with non-dairy creamer! I guess if I was backpacking and could only take a tiny amount of stuff...maybe. Now that I think about it....nope. Not even then! You could always just buy a cup at the local convenience store/gas station/coffee shop, but what's the fun in that? My RV has a 42 gallon fresh water tank that I should be using for drinking water, but I don't. It's a 1991 so I really have no idea what's been in it all along. I could (and did) sanitize it with diluted bleach solution and flushed the tank . . . but that's still not enough! Look, I know NASA uses recycled urine in their water supply, but I don't have the necessary machinery nor the space. What now? 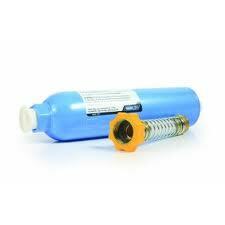 How about a high quality drinking water filtration system in addition to the one I use when filling my fresh water tank? Let's look at that. 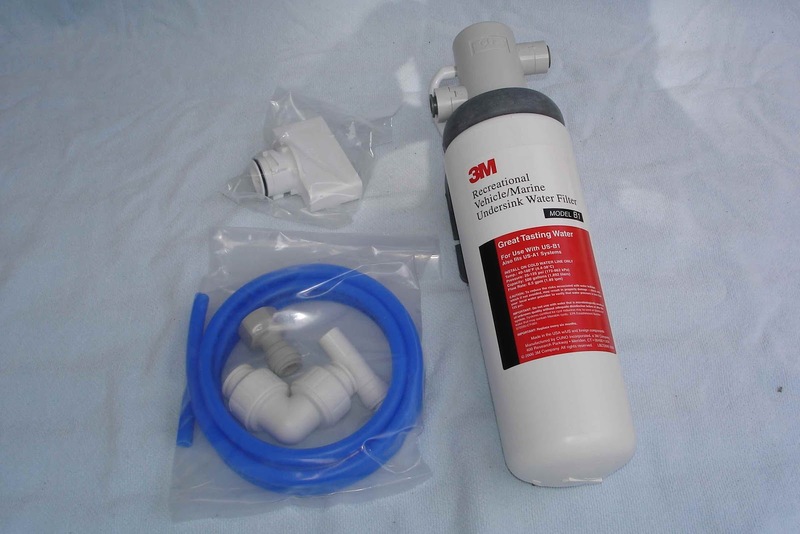 One of the least expensive filters, available almost everywhere including Walmart and Amazon.com is made by Camco and does a decent job of filtering incoming water from your hose. Whether that's at home or on the road. According to the literature it filters out almost everything. Sediment, Chlorine, Odors, and even Metals. but doesn't work on Cryptosporidia and Giardia. There is a relatively inexpensive filter that will work on those, but it doesn't flow enough to fill a reasonably sized fresh water tank fast enough. This one can be used under the sink and either plumbed in to your faucet directly, or better yet, plumbed into its' own smaller secondary drinking water spigot. That's the direction I am leaning toward. I have some room under my sink(!) and the install should be pretty straightforward. The idea is to tap into the pipe that feeds water to the kitchen sink. You could place it anywhere you have access to a fresh water pipe, but the kitchen sink seems the most convenient to me. Think cooking and drinking... To properly filter out the the bad stuff a 1 Micron or smaller filter element must be used. Since we will be filtering the water as the fresh water tank is filled with a larger (>1 micron) filter most of the sediment and other impurities will already have been removed so this filter should last quite a long time. Most kits will come with some kind of a valve with a tap for the fresh water line. Some of them include self tapping connectors. These do work, but be careful as vibration from the road may cause them to loosen and ultimately leak. If you've ever installed a self tapping home refrigerator ice maker line you'll understand why these are "iffy." The faucet/spigot assembly is quite small and you can either drill a hole for it to be installed into or do what I am doing and switch to a sprayer/faucet. This is the kind that you pull the faucet out and it becomes the sprayer. Some RVs already have these installed. When mine is converted I will have no need for the existing separate sprayer, so I can re-use that hole to install the new filtered fresh water faucet/spigot. I figure that it will be most useful to have it positioned near where I cook so it would be easy to use. All in all this is an easy modification/upgrade to get done, and not all that expensive. The parts are easily sourced online or at your local Big Box Home Stores. Try it, you'll like it! Rolling Resistance - Time For Tires! Tires. If your RV moves, you need them. I didn't give much thought to my tires when I bought the Aero Cruiser. They were from a warm climate. Stored with tire covers and looked great. Still do in fact. I knew I would need to buy them at some point and I knew that tires can have many things go wrong inside over time that WILL NOT show on the outside of the tire. It's not only about environmental conditions and driving style/speed. There are many factors that can reduce a tire's life-span. After a little bit of research, I found that every tire has a date code stamped on it. If your tire was manufactured after 2000 it will have a four digit code molded into the sidewall rubber. The first 2 digits are the week it was produced in the year. (06 would be February) and 2 digits denoting the year. (11 would be 2011.) If your tire was manufactured previous to 2000 then the date code will only have 3 digits. 2 for the week and ONE for the year. Mine were made in 1999!! Old tires aren't worth the stress and possible disaster. Another Aero Cruiser owner had a rear tire disintegrate while driving. Thankfully no one was hurt, but the damage to the RV was significant. The tire chunks ripped through the fiberglass wheel well through a support and destroyed quite a bit of the interior. This could have been MUCH worse. I am not trying to scare anyone, but with the cost of most tires, it's not much of a cost savings to put it off buying until a failure. The repair to this RV will get into the thousands very quickly. Check your tires! Low or high pressure, condition and age all can contribute to early failures. Yes, I know that tires can go past the 7 year limit imposed by the manufacturer. You'll probably be OK. I mean I'm riding on almost 13 year old tires now. That being said, I WILL be replacing them in the spring before I take any trips at all. My tires aren't that expensive or too hard to find. They are LT235/85 R16 - 10 Ply Load Range "E". That translates to a "Light Truck" tire. I will likely buy whatever model came after the ones I have now from the same manufacturer. The most important thing is to make sure the tire you buy has at least the same load range as the one your RV manufacturer calls for. Load range is what specifies how much weight and individual tire will carry at a given pressure (PSI.) It's a good idea to have your RV weighed at a location that can give you all four corners separately. Make sure you load all you gear and fill the water tank. You can go further and check the weight when you are at half tanks. Often that will change the weight distribution based upon where the tanks actually are mounted in your chassis. These weights will give a true indication of the load/weight that each tire is required to carry. 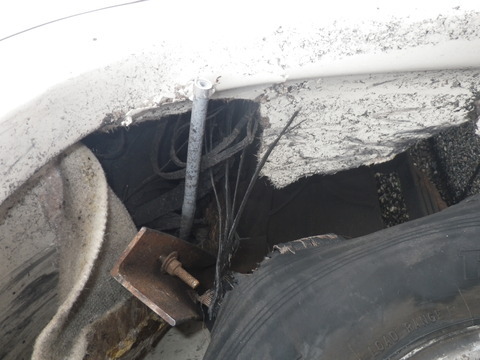 You may find you are overweight...this is bad as it puts additional stress on the tires that could lead to a failure. Not to mention odd handling quirks. The bottom line? Get the correct load range tire for your RV! Everyone who has considered buying an RV of some sort has had to make a choice, often with great compromise. I'm included in that "everyone." When I first began my quest for the perfect RV I really didn't know all that much about them. Sure, I had rented several 40ft Diesel Pushers and gas powered RVs and had owned (briefly) a small travel trailer but past that I was woefully unprepared to face the the myriad choices out there. After some basic research into the various Classes of RV....A, B, C and Travel Trailer with info about the "in-between" B+ styles thrown in, I was more confused than when I started! 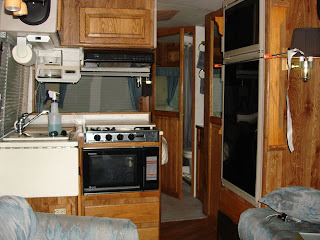 Obviously, I had to make some choices about how I wanted to use the RV and what features were must haves versus wants. This wasn't as simple as it sounds (not that it sounds simple at all, mind you!) I really had to sit down and think about what was important to me and how and where I would be travelling. After much rumination I finally had a short list, culled from the incredibly long one I started with. Large enough tanks for a minimum of 7 Days boondocking use. That being said, what would I be willing to compromise on? Obviously, if the RV itself were small, space would be at a premium. Storage. More is better, but as long as I could fit what I wanted to take with me that would be OK.
Internal space. While it had to be comfortable I could live with a smaller more efficient space. Engine power. I could deal with a smaller engine if it wouldn't struggle with hills/passing. I could spend the time to find the right RV. I could update systems as needed. I could repair/replace some items depending on cost and availability. Once I had these basic decisions made I could begin researching the various types, manufacturers, styles and models. While still a HUGE list of possibles, I had managed to bring down the size to something approaching manageable. There is a saying, "Y.M.M.V." this stands for Your Mileage May Vary. What I was looking for may not be what YOU are looking for, but the basic decisions and process remain the same. The internet is a great resource for research on everything, but the sheer volume of information can be quite overwhelming! Don't try and do everything the first day. Browse around...start with Class A's (or B's or C's) and try to get a feel for what you'd like to have. a typical Class A RV starts with a pre-built chassis and driveline, adds in water/propane tanks, a generator, the exterior body and interior fittings (appliances, cabinets, etc.) Usually these are front engine when using gasoline engines and rear when using diesel (DP or Diesel Pusher) The body fully encloses the chassis, engine and cockpit. 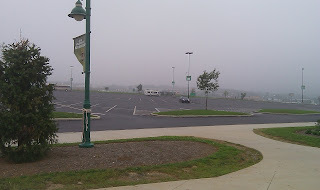 a typical Class B RV begins with a van chassis (or the whole van) and at least the front end of the host vehicle and builds on top from there. At the most simple it can be a raised roof on an existing factory van. On the higher end models it can be very much like a lightweight Class C. It has the same, albeit smaller, basics as it's Class C brethren but usually at a cost of smaller interior space, less tank capacity and smaller appliances. a typical Class C RV starts with a large pickup truck or van chassis and adds the entire living area on top. Usually there is a bed above the "cab" of the truck and the rest of the layout overhangs the chassis from side to side and over the back. They are fully equipped with generators, tanks and all the comforts of home, just like a Class A, but can suffer from the limitations of the host vehicle's weight restrictions and are usually not as aerodynamic as a Class A. Since the host vehicle is carrying a lot of weight, often close to it's normal gross (max) weight, the handling can be a bit...well...ponderous. Of course there are also travel trailers, these are designed to be towed by another vehicle and come in all shapes, sizes, configurations and costs. We'll talk about them in another article. 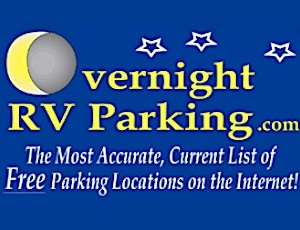 Believe me, there are some REALLY cool ones if you want to tow your RV. There are also versions that are in-between the main classes. They can be a bit bigger than their counterparts, i.e. a "B+" or have some variation on the way it's built. I have seen Class B RVs that the entire body is built by the manufacturer like a Class A...take a look at the Winnebago Via/Itasca Reyo from this year as an example. Many of these are built on the "Sprinter Chassis." Be Happy With Your Choice! floorplans and features...I wasn't, so I had a lot of years to go through. Luckily, I had stumbled upon a few RVs that fit my basic decisions within the first few months. The next step was to find out all I could about them. One, the Winnebago Rialta was perfect....or so I thought! It seems that the bathroom isn't a room at all, but an accordion folding wall Rube Goldberg contraption that just wasn't going to work for me. The process of elimination really led me to my final choice. I went through Europas, Maucks, Mallards and all sorts of oddities before I found the Aero Cruiser. Taking Up Time & Space - Air & Space Museum - The OTHER One! Recently, a friend and I took a quick trip to a place I'd never even heard about, The Empire State Aerosciences Museum (ESAM) at Schenectady County Airport in the Town of Glenville, N.Y. Being a long time pilot, I was amazed to have never even heard of this place. Especially since it is at the site of the former General Electric flight test center. After a quick call to their office confirming that they were open we set off on Saturday morning from my base 90 miles North East of NYC or about 1.5 hours away. Arrived without any incidents at all! Likely a first for me.... We set up in a small "offshoot" parking lot in front of the outdoor aircraft display. The Museum itself spans two complete buildings and a very large section of the tarmac. They have some amazing displays inside including a full size Lockheed Electra as flown by Amelia Earhart. 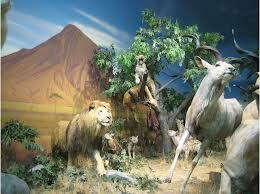 There are several interactive exhibits that you play with. Many of them are electrically powered aircraft you can "fly." I'm pretty far from being a kid these days, but they were a blast to mess with. Inside, are many old and newer aircraft; kits, military, civilian and antique. 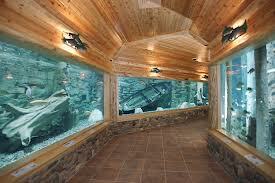 You can sit in most of them and there are no ropes preventing you from closely examining most of the exhibits. Being a helicopter pilot, I naturally liked the Hughes OH-6 chopper. In the second museum building there is an entire exhibit showing several space missions with NASA memorabilia and a large interactive moonscape. In the second room there is a 20foot+ model of a World War II Japanese aircraft carrier. The detail level was/is AMAZING! Thery were showing "TORA! TORA! TORA!" on a video monitor to set the right "atmosphere." Outside, their display is outstanding. There are aircraft from all over the world, from every branch of the armed services and many from other nations as well. Jets, Turboprops and Helicopters you can get up close and personal with. There were quite a few families there and the kids appeared to be having a great time. There's even a Mig 15 (Ex-Soviet era Chinese version) that kids can sit in and wear a fighter jock helmet for a great photo-op. Mere words cannot do justice to the myriad of sights at this "off the beaten path" destination. Here are some photos to give you an idea of what I mean! Be aware that the formatting of this article will get all funky when it's published. Sadly, I have no real control as to the layout that you'll see. But hey, the pictures are neat! So many things to see, we had to stay overnight to get a close look at everything. I highly recommend this as a stop on any trip through the area. The folks are incredibly nice and the museum is interesting and informative. If you enjoy aircraft served with a bit of history. You can't go wrong here. Besides, it's pretty neat to stay overnight at a large airport. Well, at least I think so! If you have any suggestions for similar stops, let me know. I'm starting to compile a "destinations" book now. Hey, I have to keep myself occupied during the winter No-RV season. You know? Road Trip: 1 MILLION Square Feet of Stuff AND Free Overnights! The Road Trip, a great way to get something done while enjoying the amenities provided by our "homes on wheels." If given the choice of driving my RV or flying to a destination, or even driving there and staying in a hotel, I will always choose the RV. There just isn't any other way to have such a secure feeling. I mean, you have your own "stuff," your own bed, your own bathroom and shower and get to eat whatever you want. Of course, it can be a great cost savings as well, depending on the distance and the time you are staying there. Personally, I hate packing and unpacking so having my own closet and drawers is a great thing. 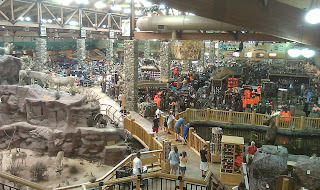 This past season, I finally had the opportunity to take a road trip to the Cabela's flagship store in Hamburg, Pennsylvania. 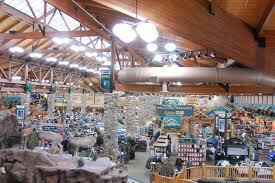 For those of you who don't know, Cabela's is a large national retail and catalog seller of all things outdoor. From camping to hunting to clothing they really have an enormous selection. I've been receiving their catalog for years. Catalogs are great, but there is no substitute for actually seeing, touching and handling something you want to buy. Enter the Mega Store! 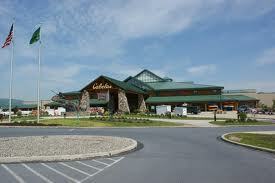 Cabela's opened this flagship store a few years back, it sits on a hill off US Route 78 and PA Routes 22/61 (100 Cabela's Drive) and is easily accessible. 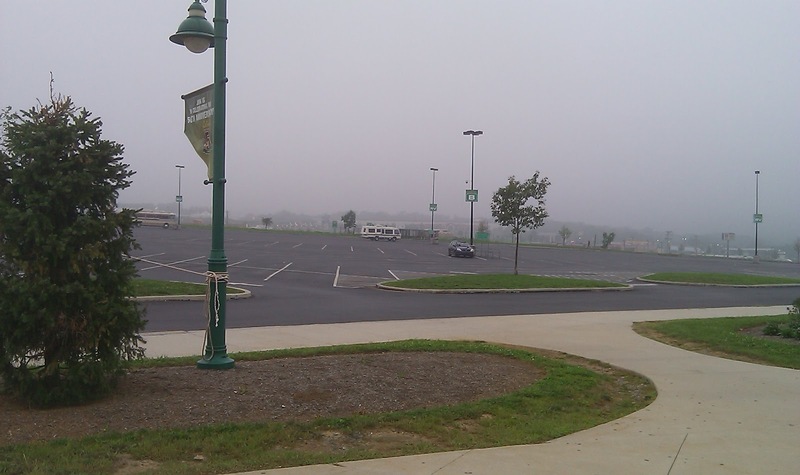 The parking lot is HUGE and, get ready, they offer free overnight RV parking AND a Fresh Water/Dump station! There's also a free set of dog kennels and a horse paddock (!) for the use of their customers. Wow, wouldn't it be nice if more businesses cared so much about their RV customers! Adjacent to the store itself (across the street, down a perimeter road) are several gas stations, a Cracker Barrel and a Large RV/Boat Retailer with parts and service as well as a Propane refilling station. Enough about the outside....once you enter the store (and get over the shock) you'll see a well planned maze of outdoor merchandise. Depending on what your interests are you'll likely find it here. I, being the "frugal" (that's a nice way of saying cheap) guy I am, make a bee-line for the Clearance section. This part of the store is always worth a look. The merchandise changes often and there are bargains to be had for the smart shopper. Of course it's the size of a regular sporting goods store all by itself. I try and work my way around the first floor from there, hitting the sections I like. If you are into firearms of ANY type, be prepared to spend a lot more time here. There is even an entire antique arms "library" you can peruse with every conceivable vintage firearm.Then I go upstairs to the restaurant for a snack and the candy/sweet shop for more snacks (for later of course.) Then on to the second floor camping and cooking sections. There's also an electronic shooting arcade on this floor. Be prepared to take MANY hours to go through the whole thing. I usually get there in the evening on the first day and then finish up the following morning before going on my way. Did I mention it isn't just shopping? There is a full sized Aquarium in the store. Oh, and a mountain in the middle that has tons of taxidermy animals all over/around/beside it...with a stream/pond complete with fish and bridges. This place is unbelievable. Besides those attractions, there is a big game museum in one corner with Lion's, Gazelles, Elephants, and a bunch of other Safari-type trophies and a separate museum for North American big game. This one has an animatronic storyteller sitting in a rocking chair in front of his rustic cabin. Press a button and he'll entertain you for a while. I try and make this a return stop for any trips I take going to the South. It's really on my way home and is simply a great area to check out. I can refill my water tank and stay for the night. I'm not really all that outdoorsy...I don't fish or hunt, but I do like camping gear and gadgets, lots of nice clothing and food. 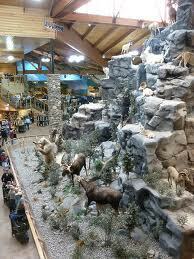 I am in NO way affiliated with Cabela's at all, with the exception of spending too much money there! I just like the place is all. Yes, I know that's obvious. Trust me....you'll like it too.